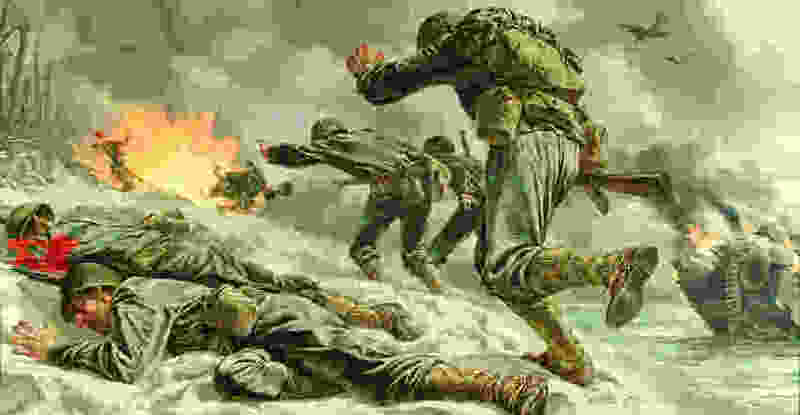 “The Beach” by veteran Tom Lea of the Marines assault on Peleliu Island in the Pacific during World War II. During World War II Japan had prepared its fronlines by fortifying is defense against the Allied Advance. As a result American Forces faced stiff resistance upon landing on the Island of Peleliu. The two month battle caused the highest casualty rate of any battle in the War in the Pacific. The Peleliu Invasion remains a controversial command decision to invade the island because of its questionable strategic value and high casualty rate. The soldiers that fought on the island have countless World War II war stories and memories from their efforts to defeat the Japanese.